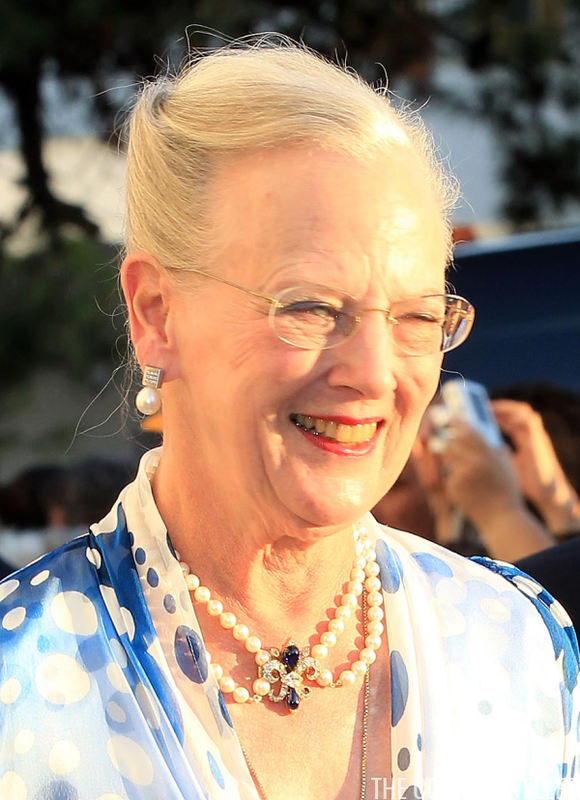 The groom's maternal aunt, Queen Margrethe II of Denmark, wore pearl and diamond earrings, plus an interesting necklace. She gathered up her pearls with a sapphire cabochon and diamond fleur-de-lis brooch. 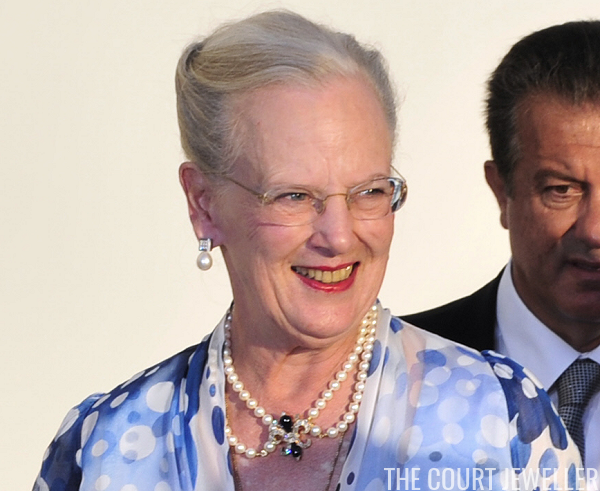 Here's a better look at the brooch, which is reportedly a family heirloom, previously worn by Queen Ingrid. Crown Princess Mary of Denmark wore her elongated gold and diamond hoop earrings from Marianne Dulong. Princess Marie of Denmark wore diamond drop earrings with a golden pendant necklace. Here's a better look at the knife-set earrings. And here's another look at the necklace, which features a monograph and the word "Fevrier" (which translates to "February"). The Danish contingent was rounded out by the Sayn-Wittgenstein-Berleburg branch of the family. 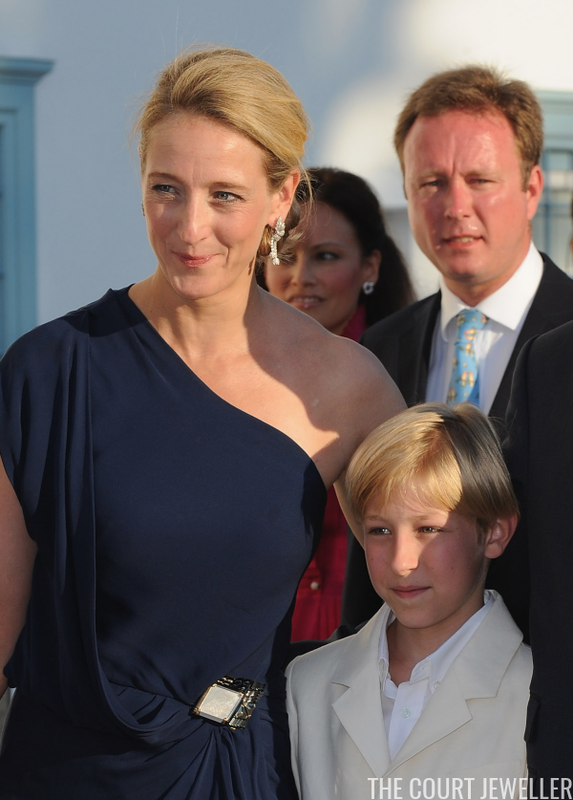 Princess Alexandra attended with her husband, Jefferson, and their son, Richard. You get a decent look at Alexandra's earrings here; behind her, you can also see the cluster earrings worn by Carina Axelsson, partner of Alexandra's brother, Prince Gustav. 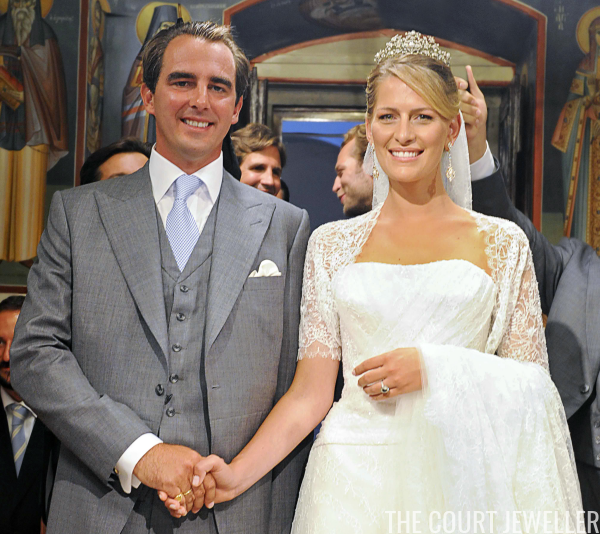 Maxima also wore her own diamond wedding bracelet on her left wrist. 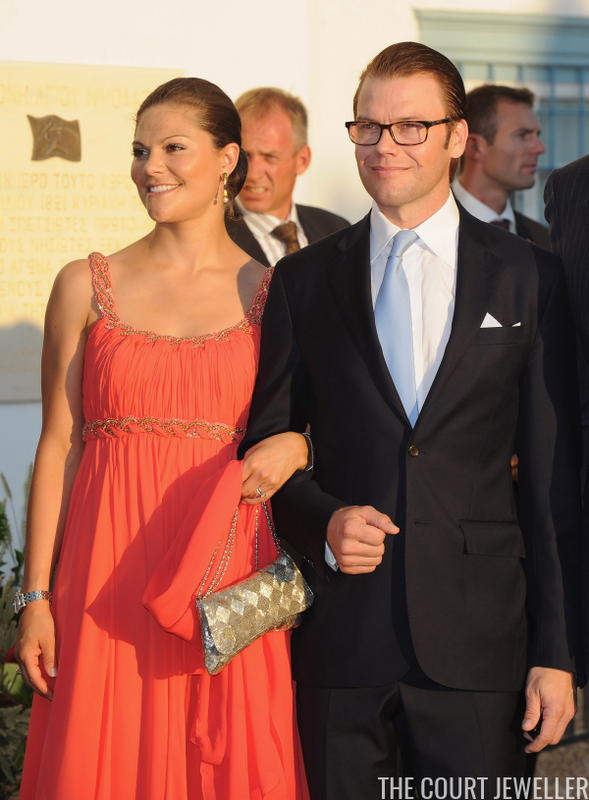 Only a few weeks after their own wedding, Crown Princess Victoria and Prince Daniel of Sweden headed to Greece for the wedding of her second cousin. She wore a fun pair of earrings set with pearls and colorful, semi-precious gemstones. Princess Madeleine and Prince Carl Philip of Sweden attended the wedding, too. Madeleine wore statement earrings, plus a huge bracelet that appears to be made of similar material to that used in the belt on her dress. Farah Pahlavi, the former Empress of Iran, wore golden cuff bracelets with a suite of pearl and coral jewels. You can see the carved coral roses, with their jade cabochon leaves, a bit better in this image. 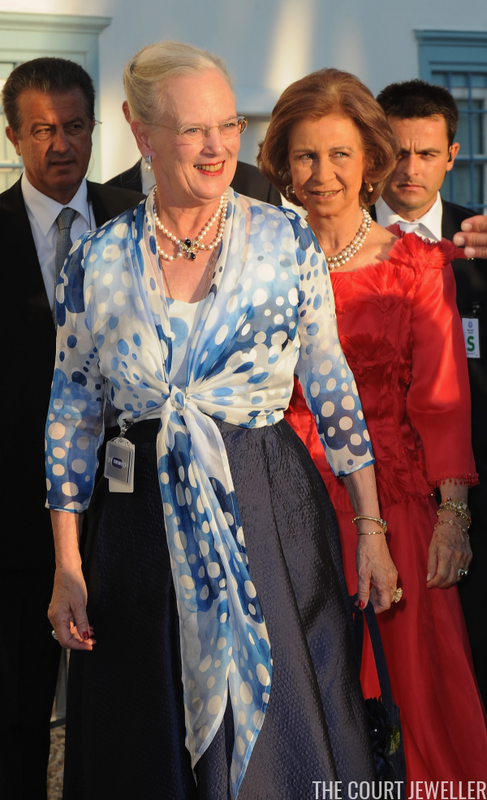 Marie-Christine wore a bib necklace made of strands of light blue beads, plus a pair of earrings featuring pale blue stones and lattice detailing. Gabriella chose a large pair of retro floral earrings. And a bit of surprise from the last princess in our flashback: Rosario of Bulgaria, daughter-in-law of that nation's last king, Simeon II. Rosario is notoriously accessory-shy, but she did add a small diamond star brooch (which appears to possibly be a nineteenth-century piece) to the shoulder of her gown. Yay, Rosario! Which jewels from this wedding were your favorites?